The Norland Leathercraft Society would like to invite you to the 69th Annual Convention Weekend for The Canadian Society for Creative Leathercraft May 3rd, 4th and 5th, 2019. The weekend Theme is Western so dress accordingly. Get your best hat and boots packed for a fun filled weekend. Rates per night are: $106 for 2 double beds, $116 for 2 queen size beds, $126 for 1 king bed, $144 for King Suite plus applicable taxes. 3 or more people per room is an additional $5 per person per day. Continental Breakfast included. Please book your rooms as soon as possible. Please indicate that you are a Canadian Society for Creative Leathercraft Member when booking as a block of rooms are being held near the meeting rooms. Schedule: Friday May 3 rd Check in after 3 p.m. – dinner on your own Branch’s set up their tables 4:00 to 8:00 pm Registration 6:00 to 7:00 p.m. 7 p.m. Workshop – Making a Hat Band. Instructor Richard Borrow Needed: scissors, soft tape measure, needles, hat to put the band around. If people are quick with a simple three strand braid, then they may want to braid two and spot stitch two together to make a wider band. Meet and Greet 8 p.m. to ? The Display Hall will be closed from the time the Judges start judging until 8:00 am Saturday. Associate and Weston Trophy Judging: All Fellow, Associate and Weston Trophy pieces must be mailed or delivered to Tundra Leather, Attn: Sean Dalgetty, 313 King Street East, Hamilton, Ontario L8N 1C1. All items must arrive by close of business at 5:00 p.m. Saturday, April 27th, 2019. If sending by courier it is recommended that they arrive by Friday April 26th. Non-Members: Husbands, wives and/or adult children are welcome to attend the Annual Meeting and/or demonstrations on payment of registration fee but will not have voting power. They may attend the banquet only upon payment of the banquet fee but without payment of the registration fee. The Old Coral Draw Table: Don’t forget to bring your donation(s) for the Old Coral draw table, please ensure that they are Leathercraft related. Registration for the Convention: Registration Fee $45.00 per General Members $20.00 per Student $65 per non member. Breaks and Lunch $30.00 per person. Saturday Banquet $45.00 per person. Please advise if any food allergies. 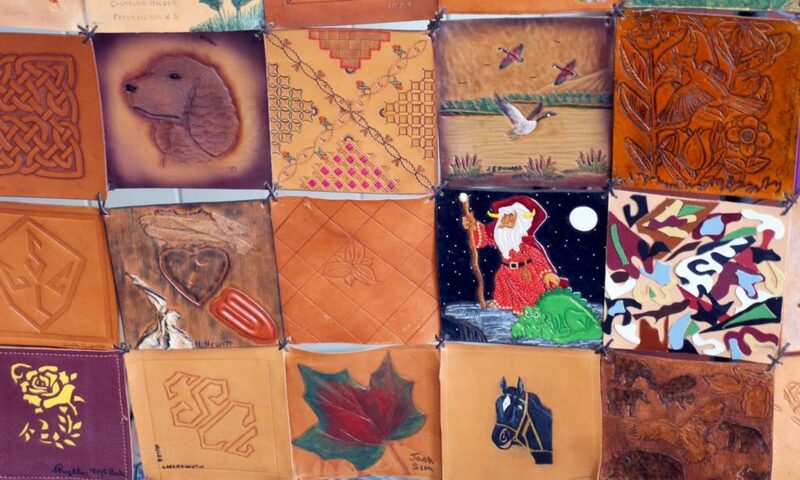 Send Registration Form and fees to: Della Chynoweth 3350 Monck Road, Norland, Ont K0M 2L0 Make cheque payable to “The Canadian Society for Creative Leathercraft” OR Pay with Interac e-Transfer and email to [email protected] and supply the information above.